Pancreatic cancer: Declined surgery and chemo. Seven years on and doing just great! Indeed a miracle. A 35-year-old man came into our centre one morning in November 2018. His first words were: Pak Baktia sent you his salam (greetings). I am his nephew. Chris: His nephew! How is Baktiar doing? Nephew: He is doing very well. In fact he is much healthier me. C: Amazing. When he first came here, his skin was dark, his whole body was itchy. He is really lucky and blessed. Perhaps one day I shall go to Aceh and visit him. What is so special about this patient? Baktia, 56 years old, was diagnosed with cancer of the pancreatic head and uncinate process with distal CBD (biliary duct) obstruction. 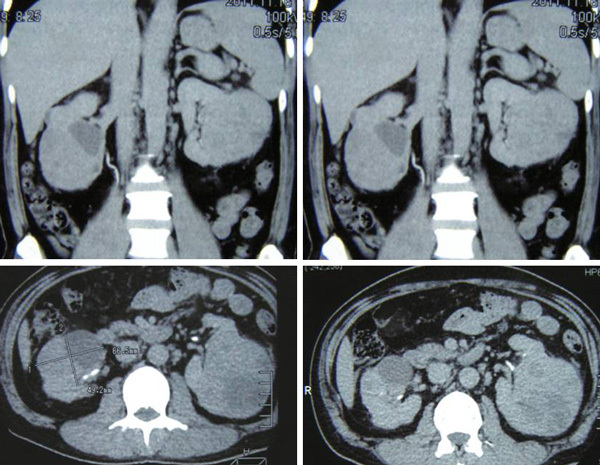 He declined surgery but underwent ERCP (Endoscopic Retrograde Cholangiopancreatography). Three plastic stents (tube) were installed to help with the flow of the bile. After the ERCP, Bak refused chemotherapy. He came to seek our help on 10 April 2011. Bak was put on the e-Therapy. After one session of the e-Therapy, the itch was reduced. After two sessions, his itch was reduced by 50 percent. After four sessions his itch was totally gone. Bak had fever. After taking a glass of Appetite & Fever tea, his fever was resolved. He went home to Aceh. Bak had to return to his surgeon every six months to change the plastic stent (tube). 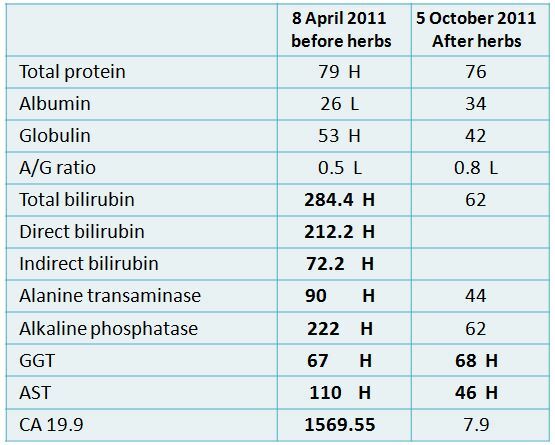 On 5 October 2011, Bak said since taking the herbs in April 2011, his health had improved. He felt more comfortable, his sleep was better and he felt more energetic. Previously he had to wake up four to five times a night to urinate. After taking the A-Kid-6 tea his urination frequency has reduced to only once a night. 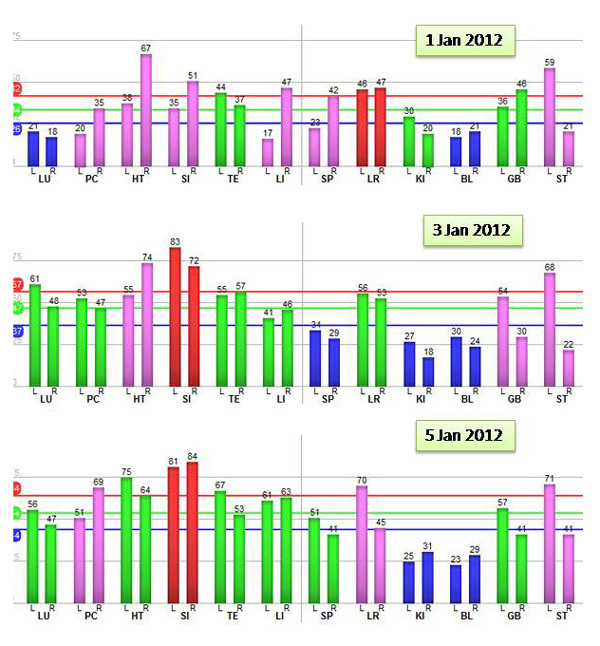 A blood test done on 5 October 2011 showed improvements in his GGT, AST and CA 19.9 (Table, Column 3). January 2015: almost four years later, Bak’s wife came to our centre. Our first question to her was, How is Bak doing now? Is he okay? Wife: Thanks be to God. He can drive around, everywhere. C: Before he came here, was he able to drive? W: No, I was the one driving. C: So, he is healthy now? C: Has he gone back to see his doctor? W: Yes. The stent had been removed and there was no need to replace it anymore. C: How many times did he need to change the stent? W: Every six months, we need to change a new stent. So we did this twice a year. In August 2014, the doctor said no need to put in a new stent anymore. If he is jaundiced, then come back to the hospital immediately. C: All these years, didn’t the doctor push him to do chemo? W: I told the doctor that my husband was on herbs. I asked the doctor if this was okay. He replied, “I don’t know” and he just smiled. The doctor knew that my husband was taking your herbs. I told him. Hi there, My name is M and I have pancreatic cancer with metastasis to the liver and lung. I found your web site while I’m searching for alternative medication for my cancer. I’m a Filipino but residing here in Australia. I am interested to try your herbal medicine. I want to know how could I get it. Hope you can give me more information about your herbal medicine and hope to see you soon. I am able to travel to see you. I’m still in good condition as of now. I will travel with my husband. Is there any specific day and time that I can visit you? Please I really want to see you. Reply: Are you from Sydney / Melb / Perth? My concern is the air travel — too taxing. But if you want to come — I am okay. Monday to Friday at about 11 am ….. go to my website www.CancerCareMalaysia.com and click what to do next . You get all the details. I need to see all medical reports and scans …. and then please read this. a) Most patient who come here, have already undergone medical treatments – surgery, radiation or chemo. Do these cure you? b) If you come here expecting me to cure you, know that I too cannot cure your cancer. From my experience, NO one on earth can cure any cancer. After some years cancer comes back again! c) But if you want me to help you – to give you another option, to have a better quality of life — may be it is possible. But it all depends on you. Because your health is your responsibility. Are you willing to help yourself? Are you willing to change your lifestyle, your diet, etc.? a) Besides the bad taste and smell. b) You need to boil the herbs a few times a day — that’s a lot of work! c) You need to take two, three or four types of teas each day. a) You cannot eat anything that walks – meaning, no meat, no egg, no milk, etc. b) Don’t take sugar (sugar is food for cancer). c) Don’t eat oily or fried food, table salt. a) May be the first 2 weeks on our therapy, you may suffer more pain, more tired, etc. That’s healing crisis. Don’t stop. Hopefully after 3 to 4 weeks you may feel better. b) If after a month on our therapy you still don’t feel better — the herbs are not helping you in anyway — then stop following our therapy. Please ask someone else to help you. c) If you feel better, continue with our therapy. If you are still on chemo or radiotherapy (or are planning to do chemo or radiotherapy), or are taking other treatments elsewhere, go ahead and continue with these treatments first, do not take our herbs yet. Good morning Dr. Teo. I am from Perth. Me and my husband would love to travel to see you. We will try to get flight the soonest as possible maybe this week or early next week. I just have one question do we need to stay there while I’m taking your medication or can we go back to Australia and bring the medication here. Thank you very much may God Bless You always. Reply: Just see me for an hour or two … you can take the herbs home and start taking them at home ….. so one or two days in Penang is good enough. Mei’s pain was gone and she became a “normal” person — can eat, can sleep, etc. just after a day in Penang! Is this a placebo effect? After returning home to Australia, Mei wrote: Thank God… I’ve been drinking the tea for 5 days now so far I don’t have any problem I don’t have any pain. I’m still in good condition. Thank you very for your concern. MT (S-127) is a 44-year old female from Batam, Indonesia. She was diagnosed with early stage breast cancer in August 2005. MT underwent a mastectomy followed by 6 cycles of chemotherapy and 30 radiation treatments. Then she took Tamoxifen for 5 years. After 5 years, MT was told to stop Tamoxifen because she was already cured. But barely a year later, in April 2011, MT started to have pains in her tail bone and shoulder blade. CT scan in February 2012 indicated metastasis to her bones. MT gave up further medical treatment and came to CA Care for help. Her health improved. Her pains disappeared. When she was well, she exerted herself causing the pains to recur. MT came back to see us again on 6 May 2012 and underwent the e-Therapy. Acknowledgement: MT granted us her permission to use this video without having to mask her face. Watch the first part of the video carefully. She walked with difficulty and with a limp. She had difficulty sitting down and had to support herself. She appeared to be in pain when moving due to the following problems. She had pains on both thighs and around her hip. Muscles cramps in both legs. Her muscles around her shoulder blades felt numb. She had pulling pains in her head. Watch the second part of the video. After two to four sessions of the e-Therapy MT appeared a “different person” free from all pains. She was able to walk normally (not limping anymore). She could sit down normally. Chris: Is there any difference in your sleep – before and after the e-Therapy? MT: I slept better after the e-Therapy. After the e-Therapy, were there more or less pains? Less pain. The lumbar region had “loosened” up and there were no more pains. The whole body felt “lighter.” I felt better when walking. You said you had pains in both thighs? You said your legs were numb? Your tail bone felt hot? At the back, around your shoulder blades – they were tight and numb – what happen now? No more. I fell “lighter” now. The pulling pains in your head? I did not feel that anymore. After two sessions of the e-Therapy and you really feel better? Yes. I felt much better. Before e-Therapy I had difficulty standing up. I had to push myself up with both my hands. Now, I am okay – no problem. Do you have problem walking? What other problems do you have now? The muscles at the lower rib region feel a bit tight. Okay, we will “repair” that. Ron (s24-not real name) is a 22-year-old male from Indonesia. About two years ago he felt numbness in his right leg but did not do anything about it. Then in June 2011, Ron had seizure in his right leg. The seizure attack lasted about 20 to 25 minutes. Ron suffered about three seizures per week. However, his right leg felt numb every day. 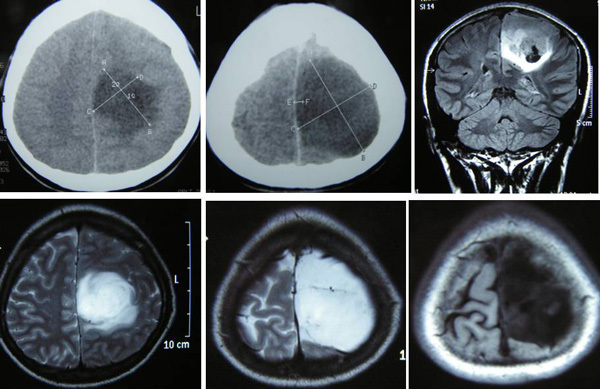 A CT scan in Indonesia showed tumour in his brain. Ron and his parents came to a private hospital in Penang in August 2011. 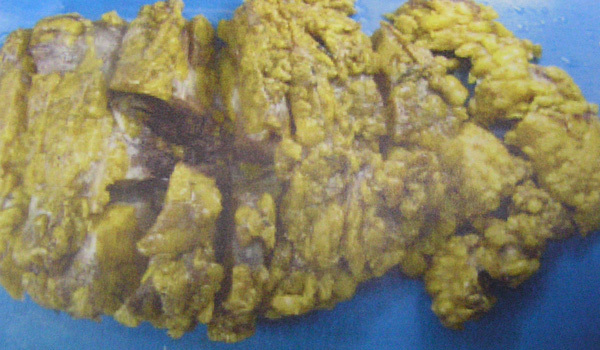 MRI of his brain was done and similarly confirmed the presence of left fronto-parietal lobe tumour with cystic central necrosis. The lesion measures about 6 x 6.2 x 6.7 cm in size. Ron was asked to go to Kuala Lumpur to consult with another specialist. Another brain MRI was performed. The report dated 22 August 2011 indicated a 7.5 x 6.5 cm mass in the left fronto-parietal region with involvement of the motor cortex. There is also involvement in the sensory cortex. Even with radiation, the treatment would not cure him. Radiation may just shrink the tumour. Ron will have to come back to Penang again after 9 months and do another MRI. If the tumour grows bigger, he needs more radiation. Ron was prescribed four drugs: Levetiracetam, Phenytoin (both for epilepsy), Dexamethasone (steroid) and Lansoprazole (for ulcer and reflux to take care of the side effects of the medications). He did not take these drugs after coming to see us on 26 August 2011. Ron was prescribed: Capsule A, Brain 1 and brain 2 tea, C-tea + Brain Leaf tea. At the same time Ron underwent e-Therapy. After only a few days, his condition improved tremendously. After a week on herbs, Ron’s health improved significantly. There was no more muscle spasm or numbness in his right leg. There was no more full blown seizure. According to his father, Ron’s facial expression was much better. He looked healthier and he felt better too. I reminded Ron and his father that our herbs are no magic potion. Don’t expect instant cure. Ron will have to take care of his diet and take the herbs regularly. The father asked, “Can we try your e-Therapy?” Yes, if you want to! Before a seizure, I had muscle cramp. Muscle cramp means numbness in my leg. Seizure means violent jerking of my leg. Before a seizure sets in, I felt the numbness of my leg first followed by violent jerking of my leg and sometimes even the upper part of my body. I was not able to stand upright and needed to lie down flat wherever I happened to be. Sometimes, I also fainted. I had muscle cramps everyday and this could last the whole day. But this numbness did not necessarily result in a seizure. But sometimes, there was a seizure. My leg jerked violently. This lasted for about 20 to 25 minutes. My heart pumped rapidly. My whole body was drained off energy and I felt tired after this. Sometimes I also sweated. The doctor prescribed four medications. These helped but I still had seizure once even with the medications. When I started to take the herbs, I stopped taking the doctor’s medications. I have no more full blown seizure. Even if a seizure seemed to come, it went off after five minutes. My heart did not beat rapidly anymore, like before. Father: His leg still felt numb but the jerking of his leg had stopped. After taking the herbs, his health had improved tremendously. Chris: Take care of your diet. Don’t worry about the initial loss of your weight. You will get back your weight after a while. Ron came to Penang again in March 2012. He had another MRI. MRI report dated 9 March 2012 stated: The tumour is still present in this current MRI and the size is 6.7 x 6 x 6 cm. There was no significant change in size compared to previous MRI. Findings suggestive of low grade glioma. (Note: previous size was stated as 6 x 6.2 x 6.7 cm). After six months without any medical treatment and with only herbs, the tumour did not grow bigger. Why? Could it grow smaller with time? Ron was not on any doctor’s medication but his health improved – no more serious seizure! Does this not prove that the herbs are effective? What do you think could happen if Ron were to undergo radiation treatment as suggested by the doctor? Why do you think patients (even rural folks!) do not readily follow or accept their doctors’ advice when it comes to chemotherapy, radiotherapy or surgery for cancer? Kidney Cancer: Remove One and a Half Kidneys Then Go For Dialysis! What if you were told to remove one kidney because of your cancer? That’s okay. I have a patient and friend, who had a kidney removed because of his cancer. He took herbs and was on our diet. He is living a good life for the past sixteen years. But what if you were told to remove one and a half of your kidneys? That would be a dilemma. The remaining one half kidney may not function. You may need to go on dialysis for the rest of your life. And what if removing your kidney does not really solve your cancer problem? Surgery does not cure cancer. It just buys you time. Cancer can recur. What if the cancer recurs? That means you need the toxic chemotherapy treatment besides having to undergo dialysis to keep you alive. What if you live in a place where you are not sure if there is a “good” dialysis facility? That is not your doctor’s problem anymore. I am not “cooking” up these questions. I had to deal with this problem not long ago – while I was on a vacation. I received this email on 20 November 2011. Knowing that he was desperate, I told him to come and see me as soon as I was back in Malaysia. So on 24 November 2011, SK and his two sons came to Penang. Below is our conversation that day. SK’s problem started about two years ago. He had blood in his urine. He consulted an urologist who prescribed him medication. The problem disappeared. Then in May 2011, there was again blood in his urine. An ultrasound of his abdomen on 27 May 2011 indicated a 67.2 x 64.2 mm mass in his right kidney and a 70.5 x 56.0 mm mass in his left kidney. SK was again prescribed medication and the problem disappeared after taking it. In mid-November 2011, SK again had blood in his urine. Accompanied by his two sons, SK went to Singapore for further consultation. A CT scan done on 16 November 2011 indicated a large mass, 6.7 x 8.4 x 7 cm in size in the left kidney. The right kidney has a nodular mass, 6.6. x 4.9 x 6.4 cm in size. Appearances are highly of bilateral renal neoplasm. A blood test on 16 November 2011 showed elevated creatinine (141.0) level. His alkaline phosphatase was at 165 (high) and GGT at 228 (high). 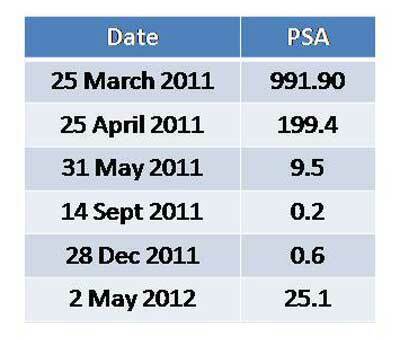 Other parameters, including AFP, CEA and PSA, were within normal range. 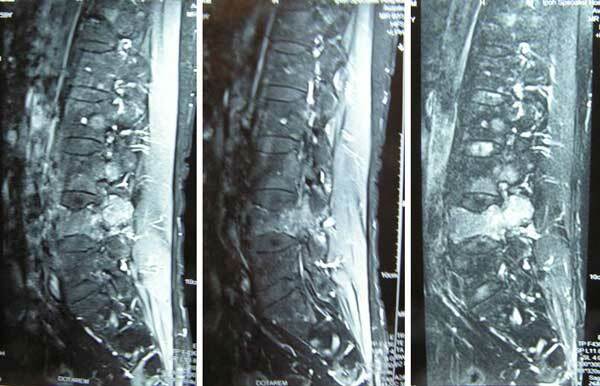 A bone scan done on 21 November 2011 indicated no conclusive evidence of any bony metastases. Based on the above, the doctor in Singapore said he was 95 percent sure that SK has kidney cancer. SK was asked to undergo an operation to remove the tumours in both his kidneys. This would involve removing one and a half kidneys. There is a 50:50 chance that the remaining one half of the other kidney may not function after the surgery. If this happens, SK would have to be on dialysis. In spite of this set back, the doctor said the tumours must be removed. SK and his sons refused further medical treatment. SK told us, “What the doctor offered me is not going to solve my problems.” He opted for our therapy. On 24 November 2011, SK was prescribed Capsule A and B, Liver Tea, Kidney Tea, Detox+ WF Tea and Lung Tea. While back in Indonesia, we kept in touch via e-mails through his son. I wish to inform you about my father’s condition. After taking the herbs for 6 days and following your diet recommendation, he felt weak, sweat very frequently, lost his appetite, felt nauseous. Are these expected? Reply: Continue taking the herbs and let me know what happen after one more week. Today my father vomited and could not eat anything. After eating he vomited. He felt nauseous. Should he continue taking the herbs? Because of the vomiting he cannot even drink the herbal teas. Please advise. Reply: Okay. Take Capsule A only. Then see what happen after that. If okay, drink Detox tea + WF + Capsule A – see what happen. Let me know. Chris. a) After stopping Capsule B, his stomach felt better, he vomited less but he still vomited at night. b) His whole body was very uncomfortable – very tired, sweating, blurred vision, dizzy when standing up. Are these the side effects of the herbs? c) Now my father is taking: Capsule A (1 capsule, 3 times per day), Energy and Kidney Teas. He does not take: Capsule B, Detox tea + WF, Liver and Lung teas. What is your advice? Should continue or stop any one of them? d) After 10 days on the herbs, we did a blood test. The results are attached. Please have a look if there is any improvement? What do you think? a) He should not have such side effects – is he the kind of person who is fussy about his food? Difficult and selective about the taste of food? b) Feeling of discomforts is because of his stomach? Any gastric problem before? Did he take Capsule A + B with honey water? c) What about his blood pressure? His blood counts were low but I don’t expect such problems. d) I have no other way. If you take the herbs and they are not helpful, go and find someone else to help you. e) Go to this link and read what it takes to be a winner. http://cancercareindonesia.com/2011/09/11/kanker-paru-otak-suatu-penyembuhan-yang-tidak-mungkin-1-harapan-setelah-suatu-bencana-empat-puluh-siklus-kemoterapi-iressa-tarceva-dan-sutent-tid Read this carefully. f) Don’t expect after taking the herbs for 10 days the blood test results are going to be better. Dr. Chris. Thank you for the information. My father is improving. He is now taking all the herbs, except Capsule B as you have suggested. In the next 5 days our herbs are going to be finished and we plan to come and see you on 21 December 2011. Would you be able to see us? a) Before he vomited, now does he still vomit? b) Any pain in the stomach? c) Does the machine help him with the stomach problem? I asked you to use the program for Stomach function program. d) Is there any pain any where? Yes, I hope day by day will be better and better. a) No, a day after coming back from Penang he felt better with his stomach. He told me that after winds came out from his stomach, he felt so good. He never needs to take the Vomit herb until now. b) He said that there is no pain in his stomach, but he felt so much wind in there. c) After coming back from Penang, and after he felt better with his stomach, he never used the Stomach function program at all. He does the cancer programs only. d) According to him, there is a little pain in his kidney (more in the right kidney), the pains comes just sometimes. Yes, he takes all the herbs: Energy, Liver-P, Kidney, Lung, Capsule A & B, Detox tea. And he is doing the machine program like you taught me. Morning, midday and at night – everyday. Alright, no vomiting anymore. Even after taking the Capsule B (before you suggested that he stop taking it because he vomited after taking Capsule B). Now he is taking all the herbs, except Vomit Tea. My father vomited again this night. He told me there was a lot of gas in his stomach. Morning and mid-day he felt good, but in the night not good (every day). What do you think? Is it the effect after take capsule B? Your opinion please. My father is not vomiting anymore. Happy Chinese New Year. Yes, my dad used the machine for his vomit. Thanks. This is indeed a sad story. I fully empathize with SK. He was in limbo having to choose between the “devil and the deep blue sea.” As a rule, any patient who comes to us with kidney tumour will be told to go back to his/her doctor for surgery. Get the diseased kidney out! Then come to us for herbs. But in this case, it is not possible for me to say that to SK. If surgery can ensure that the cancer does not recur and spread to other organs then I am tempted to “push” him towards surgery. At least SK will end up with only just a problem –dialysis for the rest of his life. But what if the cancer comes back, example to his lung? Chemo would be the obvious answer! I have fully explained this scenario to SK and his two sons. As you can hear from our conversation, SK and his family have already decided to decline further medical intervention. The treatment plan proposed by the Singapore does not make sense to him. Likewise, I tell all patients – evaluate what your doctor has got to offer you – if it makes sense, go for it. If it does not make sense, don’t go for it! It is your responsibility to make whatever decision that you are most comfortable with. Sometimes before making a decision, it is wise for patients or their loved ones to “read and read”. Don’t just listen and believe what your doctor or friends said. Find the necessary information yourself, if you can. In this way, at least you can go to the “battle” well prepared. This is exactly what I did in SK’s case. To be better informed, I searched the internet for the answers to the questions below. And you will be surprised that there are many others asking the same questions and there are equally many others who are willing to share their own experiences with you. Could You Live Without Your Kidneys? A person can live with only one functioning kidney if the other is diseased or has been removed. But no one can live without both kidneys, unless he undergoes almost daily treatments on a dialysis machine. I recently had both kidneys removed and only require dialysis 3 times a week for 4 hours each visit. In each session I filter approx 68 litres of blood. I have to take tablets for blood pressure as well as other conditions and can only drink 500ml of fluid a day as I no longer make any pee. I have a low potassium, sodium and phosphate diet. So yes, you can live without kidneys, but it’s not straightforward or easy. I don’t have any kidneys and I haven’t had any for 6 years now. I do my dialysis 3 days in a week for 5 hours at a time. About 9 months ago I had both kidneys removed. I need dialysis 4 times a week for 4 hours. I can drink 0. 5 litre to 1 liter per day, but for example I drank about 8 liter last weekend. Drink-throw up, drink-throw up, drink-throw up – that’s the answer. I currently have half a kidney on one side and one 3rd on the other half of my body. So I don’t have one full kidney. I am still living an awesome life … doing anything I want. 2. So, what is your life like on dialysis? Obviously it is going to be a life changing thing but something that we must learn to cope with and becomes part of our life. No one would choose dialysis versus normal functioning kidneys. However without dialysis life is not possible at all. There are risks of taking off too much fluid or not enough fluid. There are risks of infection, both blood infections and infections of the fistula. Again, no one volunteers to do dialysis but it is definitely better than dying from renal failure. In my experience, patients usually learn to cope well and make it a “normal part of life”. I went on dialysis at age 45 and did very well. Most of the time I felt very good. I was in good shape. Here is what worked for me. I was very compliant with my treatment. I did not skip dialysis sessions and I didn’t end them before my time on the machine was done. I followed the diet, which can make a big difference in how you feel. I did not have fluid restrictions. I took all my medicines. I had very good doctors and an extremely good nursing team at dialysis. I tried to educate myself about dialysis & kidney disease. My brother suffered total kidney failure and had to go on dialysis. He feels constantly tired and generally ill, he’s on a massively strict diet plan (rule of thumb: if it’s nice, you probably can’t have it). Although he can do occasional driving work on my uncle’s farm, anything more than a half-day’s worth leaves him exhausted. My mom was on dialysis. My mom has said she would rather die than do dialysis again. The restrictive diet was really hard especially the drinking less liquid part of it. Having said all that her Doctors were quite firm with her that she should continue working and have as normal a life as a possible while doing the dialysis, they said and I can see this to be true, that removing the things that normalize her life would make her more prone to depression and more apt to feel awful about her treatment. So she continued to work. I am a 37 yr old female. To be perfectly honest I HATE dialysis, I hate having to sit in a chair for 3 and a half hours, bored, and senseless out of my mind, hardly a soul to talk to, having to sit without moving in case the stupid perm-a-cath in my neck decides to play up, the fact my pulse races anywhere up to and over 150. If it wasn’t for my husband, son and mum and dad I think I would just tell them to get lost and do without it. I am starting to hate Monday, Wednesday and Friday – the days in between aren’t much better. If I am not out in hot flushes in throwing up, but because of my family I keep going. Deciding not to do dialysis is not suicide!!! It’s natural. I personally do not do well on dialysis but I see other people that do better. No one in my center is happy about being there especially me. On dialysis days I go from 5:30 am to 8:30 am. I can’t drive after this because it takes such a toll on me so my husband picks me up and takes me home and goes back to work. I am down for the day. They next day I feel a little better so I get some house work done and cook dinner for 2 days in advance. I always said I would not do dialysis but here I am doing it with the hope of getting a transplant and that is the only reason I have continued for 5 months. My quality of life stinks. I have nothing to look forward to. It is starting to take a toll financially. My marriage is suffering in several ways. So what I am living for is not to disappoint other people. I feel like a burden. I want my life back. My brother has been on dialysis for 5 years now and is 24. The only thing that bothers him about dialysis is it can become an inconvenience. It does make him weaker and very tired, but only on the day he has it, and this usually only lasts a few hours. But as most people have said there is a fluid intake limit and if the patient exceeds this limit it can have side effects such as sickness. The machine affects everyone differently. I have been on dialysis for almost three years. At first I liked going because it made me feel so much better. Then it was annoying and boring. Then I hated it with a passion and resented having to go. Now I just accept it and go, trying to make the best of it with books, CDs and my portable DVD player. Those three days a week make the rest of my life possible. On the regular days, I am reasonably energetic, I exercise and eat well, so I look as healthy as anyone else, maybe more so. 3. How long can a person live on dialysis? I’m 62 yrs old and have Agent Orange Cancer and diabetes type 2. I will be stopping dialysis, just too tired to keep going. Yes I know that it is death warrant but it is time to let go. My wife is on dialysis. I have heard of people being on it for over twenty years, So, if you take care of yourself, it should be able to go indefinitely if needed. I have been living with dialysis for the past 24yrs (I am 43yrs old) and I still doing quite well. So how long can a person live on dialysis. As long as they need to, or as long as they want to, or as long as they can. It’s just like how long can you live at all. Tomorrow isn’t promised to anyone, regardless of their health! My great aunt has been on dialysis for about 15 years! She’s living a long and healthy life so far. As of now, she is 89 years old! The answer to that varies with individual. I have been on dialysis for 3 1/2 years now. It has been a horrific experience. One, the big dialysis machines (hemo) WILL KILL YOU. They beat you senseless so you have the shakes the rest of the day and get NO sleep at night. So you just sort of try and recover the next day, so you can get pasted all over again. Two, have a career? Forget IT. Once you have been tagged as a sicky you are going nowhere fast, no matter your degrees or training. Three, hemo dialysis just weakens you in the short run, medium run, and long run so other diseases can take hold. The person who answered that you can have a long productive life on dialysis is a quack. probably one of these quack doctors in the field. They probably never did one hour on dialysis. YOU WANT REALITY? Take it from a REAL patient. My father just passed away last month, he had dialysis for almost ten years. I can see him getting weaker and weaker each day. Finally his heart became so weak that he cannot take dialysis anymore. There are a lot of good answers in here. Unfortunately, it’s tough to give an accurate number since every case is different. One patient might make it for 20+ years, another might not make it to 4. A lot depends on how well the person takes care of themselves during dialysis and how much kidney function they have left. It seems to me, the less kidney activity you have the worse off you’re going to be. The prognosis for kidney cancer is usually good when a single kidney is removed and the cancer is at its early stage. If both kidneys are removed or the remaining kidney does not function well enough, patients need hemodialysis or a kidney transplant. Unfortunately kidney cancer has a tendency to reoccur after surgery. When that happens, the game is virtually over because metastatic kidney cancer is generally resistant to chemotherapy and radiotherapy. You may then ask, “So what can CA Care has got to offer?” As I have always said to patients. “We have nothing to cure your cancer – for whatever cancer you have!” Go to your doctor if you want a cure. Go to your doctor if you want to put up a good “fight” with your cancer. Come to us if you want healing. At CA Care we teach you how to live with your cancer and with our herbs and change of lifestyle and diet, hopefully these will help restore your health. We hope to help rebuild your life so that you can still continue to live a pain-free and meaningful life without fear. We want you to recognise that death is an inevitable part of life. Therefore you should be living your life without fear. Don’t you not realize that the day we are born, we are destined to die? No one can escape this ultimate destiny. 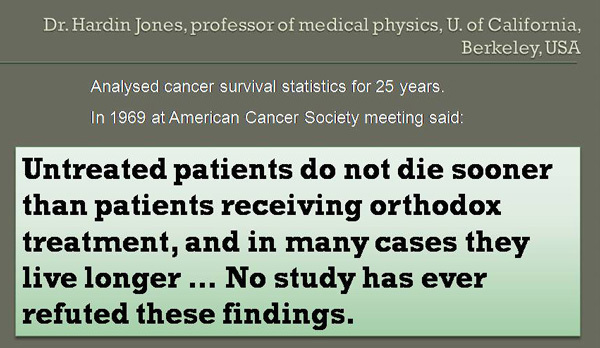 Medicine cannot win over death no matter how heroic your doctor’s effort is or how great the technology applied is. Rather than fight, let’s accept the inevitable so that we can live a more relaxed and happy life. Hallo Dr. Chris, My father’s health as a person is not bad. He can do some activities every day. He is in Jambi now. He came back to Jambi at 12th January 2012. Dr. Chris, do you think that my father have a hope to survive with his condition, your opinion please. He does all your suggestions, diet etc. Do you think the sciatica and sore in his waist is normal? Thanks. Acknowledgment: The patient granted her permission to use this video without having to mask her face. MN (S-81) is a 56-year-old lady from Indonesia. She and her husband came to a private hospital in Penang to search for an alternative treatment for her Non-Hodgkin’s Lymphoma. But there was none. She was given the same option – undergo chemotherapy again. They live in Labuan Batu, a town south of Medan. Coming to Penang is a long journey indeed. From home, first they had to travel for 9 hours by bus (or 6 hours by train) to Medan. After an overnight stay in Medan, they took a plane to Penang. Sometime in early 2011, MN felt lethargic. Her stomach was painful. She had profuse sweating, specially her head . For the past one year she had been coughing. Doctors were unable to cure her coughs. In May 2011, MN was diagnosed with non-Hodgkin’s lymphoma. She underwent six cycles of chemotherapy with CHOP. After the completion of the chemo treatment the cancer recurred in the form of a small swelling at her left collar bone – at the same spot where she did a biopsy earlier. MN was asked to undergo another round of chemotherapy. She refused and came to Penang looking for alternative medicine. (Note: CHOP regimen consists of four drugs – Cyclophosphamide, Doxorubicin (or Adriamycin), Vincristine and Prednisolone. The first three drugs of the CHOP chemotherapy regimen are usually given as injections or infusions in veins on a single day, while prednisolone is taken as pills for five days. Each cycle is repeated every 3 weeks for 6 to 8 cycles). MN received her treatment in a government hospital in Medan. Each treatment required a two-day stay in the hospital. The first five chemos seemed to help MN. Her health seemed to improve. However, the sixth chemo was “bad”. Her health deteriorated – “dropped”. She had no strength and was not even able to climb out of bed by herself. She had to be hospitalized for two weeks. After being discharged from the hospital, she regained some strength. She was able to walk for about 10 metres and had to stop. At home she was not able to do anything. Her husband had to do all the house chores. After chemo, her stomach pains disappeared but her one-year-old problem of coughs and profuse sweating persisted. One and a half months after the completion of her chemo, a small lump appeared at the collar bone – the same site where she first had her biopsy. The doctor in Medan confirmed it was a recurrence. She was asked to undergo a second round of chemotherapy. 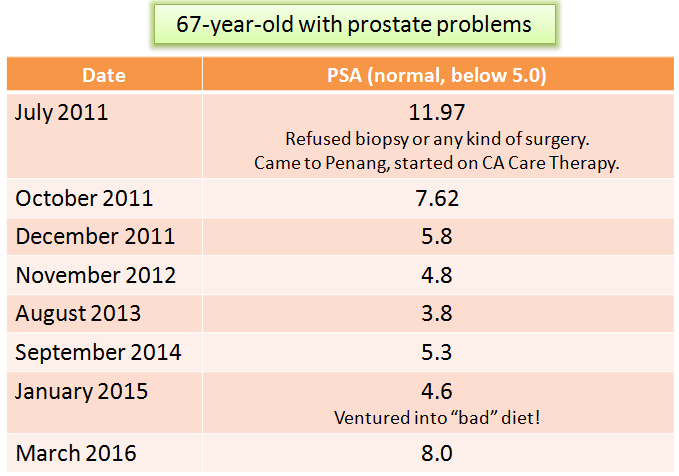 MN and her husband came to a private hospital in Penang in December 2011 in the hope of finding an alternative treatment to chemo. But she was told to do more of the same thing – undergo more chemotherapy! The oncologist suggested two options. The first option is to use drugs that cost RM 7,000 per cycle. This means, the six-cycle-treatment would come to about RM 42,000. The oncologist told them that this treatment will cure her cancer. The second option is to use cheaper drugs costing RM 3,000 per cycle. But the effectiveness is uncertain. Chris: Well, that means you have to sell your house to pay for the treatment? Chris: Do you believe what the oncologist told you – that the expensive chemo can cure you? MN and her husband were disappointed. They did not find the alternative treatment they wanted from the hospital. They did not know what to do next. However, a day later a lady told them about CA Care. Chris: So you came to see us (on 18 December 2011). MN was prescribed Capsule A, Lympho 1 and Lympho 2 teas, C-tea and Cough No 3, 5 and 11 for her problems. She was also told to take care of her diet. Chris: Yesterday you told us that before you first came to Penang (in December 2011), all your friends who saw you cried. Why did they cry? Chris: Are you sure that after taking the herbs for three weeks you are really better? Chris: Praise and be thankful to God for this blessing. Chris to Husband: Ho, ho, you don’t have to do any more work! Very good, very good. NM and husband returned to Penang after taking three weeks of herbs. This was in January 2012. She underwent three days of treatment with the e-Therapy. Chris: Oh no – I have to take care of your husband too? Chris: You are indeed blessed. After seeing the oncologist in the hospital you all were disappointed because you could not find what you wanted from the hospital. You did not know where else to turn to. But a day later – after you prayed – an “angel lady” appeared and told you about CA Care. Chris: Indeed it was a blessing from God. I fully understand the situation you are in. Chris: I am so happy that I am able to help you. This is my advice – please go home and take care of yourself well. Take care of your diet, exercise and take the herbs. My herbs are not magic but I believe they do help you. MN and her husband returned to CA Care on 8 January 2012 and underwent the e-Therapy. Her coughs were almost gone – now she coughs once a while. Previously it was continuously. The “heaty” feeling in the left side of her abdomen comes once in a while. Previously it was often. Profuse sweating in the head was much less. Previously it was soaking wet and happened often, day and night. She slept well. Before it was difficult. Numbness of her fingers was gone but the numbness of her legs persisted although there was improvement. She had more strength to walk. She could walk 100 metres without feeling tired. Previously even doing 10 or 20 metres was difficult. The only problem she has now is a feeling of “ discomfort /numbness” in her right shoulder. Numbness of the legs was much less. Numbness of her legs had improved further. Urination and bowel movements were better. She had no more coughs. Discomfort in the left shoulder still persisted. The discomfort in the left should was gone. Many Indonesian patients who come to seek our help need to travel from afar. We empathize with them. This is indeed a test of their commitment and a testimony of their real desire of wanting to help themselves. In contrast, we have phone calls and e-mails from patients who live just a few miles away and yet they complained that it is difficult to come and see us. They prefer consultation over the phone. Similarly we have patients from Sarawak, Sabah or Singapore who only want us to help them through the phone or internet. Unfortunately, we cannot help such patients. It is better that they go and seek help from herbalists nearby their homes. Life is easier that way – for them and also for us. But for those like MN, who have travel so far to come and seek help, we pray that we never let them down. We shall do our utmost best to help them. Indeed this case is an example of a wonderful and rewarding effort that makes our day real great. We thank God for His blessings – and hope many more cases like this will continue to come by our way.